(iii). Officers with Five Years regular service at the level of Deputy Secretary of Central Government in the grade pay of Rs.7600 and having Three Years’ experience in the field of finance and accounts. with at least 5 years of regular service in the grade pay of Rs. 6600 And. (a) Master's Degree in Science (preferably on Biological Sciences); of a recognized University or equivalent. iii) With 10 years of regular service in the post in the relevant field in the PB-3 with Grade Pay of Rs. 5400. A 01 Officers from Ministries/ Departments of Government of India/ State Government/ Union Territories/ Statutory/ Autonomous Bodies, holding analogous posts on regular basis or posts with GP of 6600 and above with 5 years of regular service in this grade. A 01 Officers under the Central/ State Govt./ U.T. Administrations or of Central Statutory/ Autonomous Bodies holding the analogous post or with at least 5 years of regular service in the post with grade pay of Rs.5400 and have 5 years’ experience as a Stores Officer on regular basis. A 01 Officers from Ministries/ Departments of Government of India/State Government/ Union Territories/ Statutory/ Autonomous Bodies holding analogous posts on regular basis or with 5 years of regular service in the PB- 3 + GP of 5400.
ii) With 5 years of regular service in the relevant field in the grade pay of Rs. 5400. Deputy/ Assistant Nursing Superintendent with 5 years regular service in the Grade Pay of Rs. 5400. At least 5 years of regular service in the post in the PB-3, with Grade Pay of Rs. 5400 or higher. CSSD Supervisor with five/ seven years of regular service in the grade pay of Rs.5400 or 4600 respectively. A 01 Officers from Ministries/ Departments of Government of India, CPWD, MES, BRO, DoT, State Government/ Union Territories, Engineering Services, and other Engineering Departments of the Central/ State/ PSU/ Statutory/ Autonomous Bodies working holding analogous post OR in PB-3 GP 5400 with 5 years of regular service in the grade, OR in PB-2 GP 4600 with 7 years of regular service in the grade. A 01 Architects or officers in equivalent grade in CPWD Possessing a Degree in Architecture and having not less than 5 years' experience in the line. In the event of suitable officers not being available from CPWD, similar officers from other Central Government departments or Central Autonomous/ Statutory Bodies or Public Sector Undertakings may be considered. above, preferably having experience connected with security, handling agitations strikes of employees. with at least 7 years of regular service in the post with Grade Pay of Rs. 4600 or higher. Bachelor’s Degree in Material management from a recognized University/ Institution and 3years' experience in store handling (preferably medical stores). A 01 Officers under the Central/ State/ U.T. Governments/ Universities/ Statutory/ Autonomous Bodies or Research and Development Organizations. ii) With 2/3 year of regular service in the relevant field in the grade pay of Rs. 4800 OR 4600 respectively. B.Sc. (Post-certificate) or equivalent such as B.Sc. Nursing (Post-basic) (2 year course) from a recognized institute/ university. With 3 years of regular service in the post of Dietician in the Grade Pay of Rs. 4600. (b) 5-year experience in the relevant field. II. with 10 years of regular service in the relevant grade pay of Rs. 2400 in the relevant field. B 05 Officer of the State/ Central Government or Central Statutory/ Autonomous Bodies holding analogous posts or with at least 5 years of regular services in the post with Grade Pay of Rs. 4200 or higher. With 10 years of regular services in the grade pay of Rs. 2400 in the relevant field. ii. Junior Account Officer with five years of regular services in the grade pay Rs. 4200. With 5 years of regular service in the grade pay of Rs. 4200. CSSD Supervisor with 5 years of regular services in the grade pay of Rs. 4200.
ii. Holding a post in the grade pay of Rs. 2400 with 10 years of regular services in the grade. Holding a post in the grade pay of Rs. 4200 with 5 years of regular service in the grade. ii. Holding a post in the grade pay of Rs. 2800 with 6 years of regular service in the grade. B.Sc. Degree Or Equivalent From a recognized University and Bachelor Degree or Post Graduate Diploma or equivalent in Library Science From a recognized University or Institute. Junior Medical Record officer with 6 years of regular services in the grade pay of Rs. 2800 in the relevant field. Jr. Engineer (Civil) with 5 years of regular service in the grade. Jr. Engineer (Electric) with 5 years of Regular service in the grade. With 5 years of regular service as Junior Engineer. ii. With 5 years of regular services in the grade of Pharmacist Grade– I in the grade pay of Rs. 4200.
ii. With 6 years of regular services in the grade of Pharmacist Grade – II grade pay of Rs. 2800. B 04 Officers under the Central/State/U.T. Governments/ Universities/ Statutory/ Autonomous Bodies or Research and Development Organizations. 1. B.Sc. in Medical Lab Technology or equivalent. 3. Diploma in Medical Lab Technology or equivalent. C 02 Officials holding analogous posts in govt. organizations or holding posts with 5 years of relevant experience in GP of Rs. 2400. C 03 Officers from Ministries/ Departments of Government of India, State Government/ Union Territories and other Engineering Departments of the Central / State/ PSU/ Statutory/ Autonomous Bodies holding the analogous post in the department of Air Conditioning & Refrigeration. With at least 5 years of regular service in the post Grade Pay of Rs. 2400 in the relevant field. C 04 Officers under the Central/ State Govt., U.T. Administrations or of Central Statutory/ Autonomous Bodies holding analogous post OR With 8 years regular service as the plumber in the grade of Rs 1900. A degree of recognized University or equivalent Proficiency in computers. On the basis of Written Test/ Skill Test. 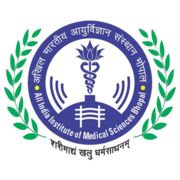 Eligible candidates may send their application in prescribed format (attached below) to The Administrative Officer All India Institute of Medical Sciences (AIIMS) Administrative Block, 1st Floor of Medical College Building Saket Nagar, Bhopal-462020 (M.P.) by Speed Post/ Registered Post only on or before 22 Apr 2019 05:00 PM, along with the relevant documents.